Where In the World is Bin 20 B? Luca brought us through the maze of Roma Termini Station. We parted ways in front of the train departures screen with plenty of time to spare. We relaxed a bit while we waited for Campobasso to come on the screen and tell us which bin (binario – which means track or line) our train would be in (There are a total of 24 bins. Each bin is the platform to which your train will arrive or depart.). 20 B popped up and we promptly went to bin 20 and walked down to sign B and waited. (The long bin has sections of A, B, C, D, E, and F). We unloaded our packs to the ground and got everything ready to stroll on board and get settled in. 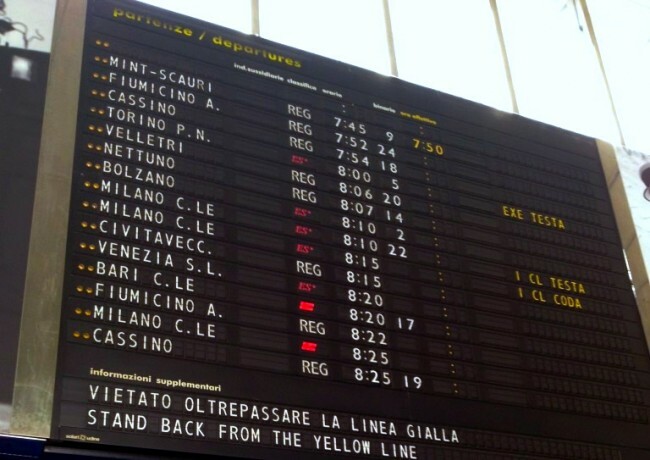 About 10 minutes before departure, a train pulled in that said it was headed to Cassino… What? I’m confused? Did they move trains? Our train is supposed to say Campobasso, not Cassino. I told Jill to run back to the beginning where the departures screen was while I carried both packs and Rum on my back. The departures screen stated 20 B still? I’m even more lost! We were at 20 B… OK turn and run back down the platform to see if we missed something… Jill ran ahead with Stella in the stroller and the rolley suitcase, and I ran as best I could at this point, struggling with an extra 100+ pounds. In our frantic running, with no other train in site after the Cassino train, Jill happened to see a sign down the track that said 20 BIS with an arrow… down at the very very end… WHAT?!?! RUN!!! We ran what seemed like miles, but was probably the length of a football field. There was the train, down around the corner out of site. Jill got there before me, yelled to Stella “JUMP ON!”, and threw her stuff in. I hobbled up behind, tossed down the luggage, trying to breath and jumped on board. We made it, our legs shaking, beet red, barely able to lift our arms. We looked like crazy people I’m sure. I could tell because of the look on the two old ladies sitting there, staring at us, their eyes saying a thousand words. With seconds to spare the train took off and we were on our way to Sepino. What the hell, I thought we were veteran travelers? We look like amateurs! Time to get it together! By the way, B after your bin number refers to BIS. BIS means encore, or after, thus the second train or platform. We will forever remember where bin 20 B is in Roma Termini Station. Oh, LOL…I was lucky that my first train catching experience was in Great Britain as I was constantly asking, “Am I going the right way?” Even in English, it was so confusing..But, dont you love trains? I do..wish we had them all over Texas. LOL sounds like crazy fun just another thing yoou have under your belt that you will now kow for next time.